A Chicago man who committed an armed robbery near the Gold Coast on Friday was arrested an hour later when his victim crossed paths with him again at a neighborhood currency exchange, police said. Now, the 20-year-old is charged with multiple felonies. Vladimir Artis approached a 30-year-old man in the first block of East Elm at 7:55 a.m. Friday and demanded the victim’s wallet while holding him at gunpoint, police said. The victim complied and Artis ran away. A police report was filed. About an hour later, the victim found himself standing near Artis at a currency exchange in the 100 block of West Division. 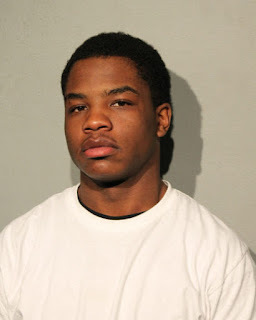 Cops were called again, and Artis was arrested after he led police on a short foot chase through the Clark/Division Red Line station and a nearby condominium building lobby, authorities said. Artis was carrying a handgun with a defaced serial number when cops caught him, prosecutors said. He is charged with armed robbery with a firearm; possession of a defaced firearm; and aggravated unlawful use of a weapon. A judge ordered him held without bail.